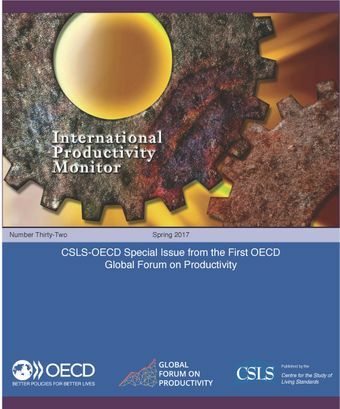 The 32nd issue of the International Productivity Monitor is a special issue produced in collaboration with the OECD. All articles published in this issue were selected from papers presented at the First Annual Conference of the OECD Global Forum on Productivity held in Lisbon, Portugal, July 7-8, 2016. The Forum was established by a large group of OECD member countries in 2015 to provide a platform for the mutual exchange of information and international cooperation between public bodies with a responsibility for promoting productivity-enhancing policies. The primary purpose of the Forum is to shed light on the structural and policy drivers of productivity, especially in the context of the generalized slowdown in productivity growth affecting OECD countries. It helps generate synergies in policy-oriented research; share data, results and insights; and facilitate the diffusion of best policy practices leveraging on both cross-country analysis and country-specific experiences. To this end, the Forum organizes conferences and workshops connecting policy-makers, academics and other stakeholders and proposes and coordinates research programs in areas related to productivity, notably by encouraging collaboration with national experts, to extend and support work done at the OECD.